The Critics Choice Award nominees have been released. While you can see below that LINCOLN and LES MISÉRABLES earned 13 and 11 nominations respectively, we first want to give you the categories you, geniuses, are most interested in: Best Score and Best Song. You'll find all of the nominations below those. (Los Angeles, CA – December 11, 2012) – The Broadcast Film Critics Association (BFCA) has announced the nominees for the 18th annual Critics’ Choice Movie Awards. The winners will be announced live at the Critics’ Choice Movie Awards ceremony on Thursday, January 10, 2013 from the Barker Hangar in Santa Monica, Calif. The show will broadcast live on The CW Network at 8:00 PM ET/PT. Movie fans can indeed vote on their favorite film franchise and watch as the winner is announced live on the Critics' Choice Movie Awards on The CW on January 10th. 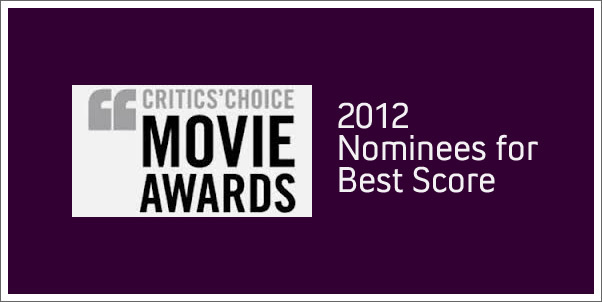 This is the first fan-voted award in the history of the Critics' Choice Movie Awards. The nominees include: Batman, Harry Potter, Indiana Jones, James Bond/007, Lord of the Rings, Spider-Man, Star Trek, Star Wars, Toy Story and Twilight. Voting begins today and fans can vote on The Official Critics' Choice Movie Awards Site, The CW and many of the Internet's most popular entertainment sites including CELEBUZZ, POPSUGAR, Entertainment Weekly, Rotten Tomatoes, Wonderwall, Summit Entertainment, Warner Bros., AreYouScreening, Awards Circuit, Screen It, Slug Mag, Lights Camera Jackson and Scene Stealers. The Critics’ Choice Movie Awards are bestowed annually by the BFCA to honor the finest in cinematic achievement. The BFCA is the largest film critics organization in the United States and Canada, representing more than 270 television, radio and online critics. BFCA members are the primary source of information for today's film going public. Eligible films were released in 2012. The accounting firm of CMM, LLP tallied the written ballots. The Broadcast Film Critics Association (BFCA) is the largest film critics organization in the United States and Canada, representing more than 270 television, radio and online critics. BFCA members are the primary source of information for today's film going public. The very first opinion a moviegoer hears about new releases at the multiplex or the art house usually comes from one of its members. For additional information about the BFCA and its membership, visit its website at www.criticschoice.com.